Teletalk bangladesh limited lunched Flash MiFi 3G Router for their customers & offering 21GB free 2mbps internet data with it.Make your room WiFi and connect with 10 devices!! Buy NOW and get promotional discount.21 GB Free Data (30 days usage validity, in 3 installments- 7GB each month ). • Up to 10 devices can be connected. 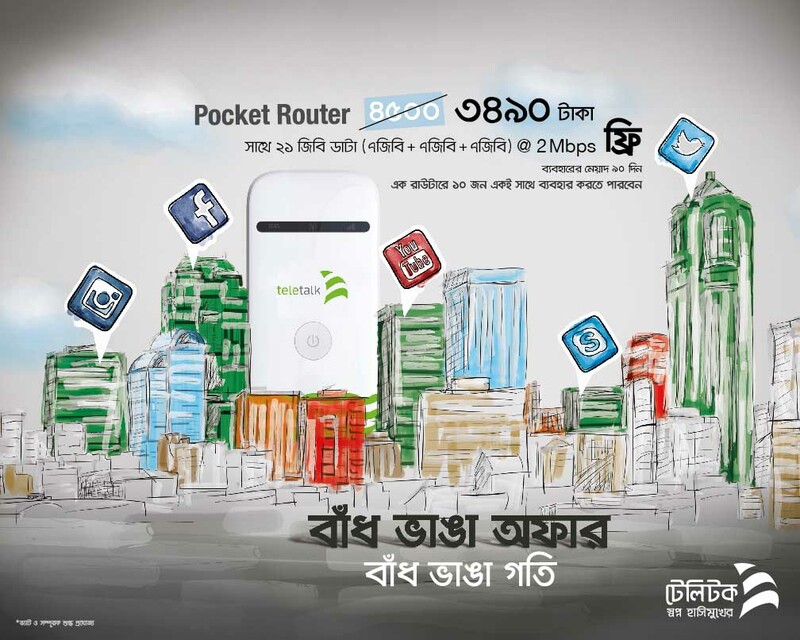 • Flash MiFi Router can support download speed up to 21.6Mbps and upload speed upto 5.76Mbps. • Wi-Fi range upto 30m (Depends upon surrounding conditions). • Plug and Play facility. • MICRO SD card slot supports up to 32GB storage. • Operating system compatibility Win 8/7/XP, Mac OS 10.7 & Linux. • Before use MiFi please dial 1515 for SIM Card Activation. •• For postpaid connection,please visit your nearest Teletalk Customer Care Centre.